Pcb Artist® 4.0 Design Software features advanced layout capabilities, library of over 500,000 components, and free technical support. This software provides special wizard for simplifying the creation of inductive coils. Pcb Artist® 4.0 can import Schematic (.sch), PCB (.brd), and Library (.lbr) files via Native Eagle Import feature. Software feature automatic component rename option. Advanced Circuits, North America's third largest printed circuit board (PCB) manufacturer, has released version 4.0 of PCB Artist®. The free design software offers many features and functionality found in paid PCB design packages without the price tag. 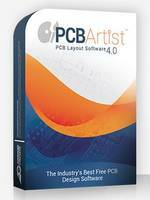 PCB Artist® includes advanced layout capabilities, a library of over 500,000 components, and free technical support. Enhanced Powerplane Thermal Controls for full control of connection parameters to plane layers. Spiral Wizard to simplify the creation of inductive coils. Automatic Component Rename feature for easy organization and modification of reference designators. Native Eagle Import of Schematic (.sch), PCB (.brd), and Library (.lbr) files.